Note - how the model indicates the island is not yet viewable and still below the horizon. Is it best to do so from 1,000 feet or 10,000 feet? Keeping in mind the trade off of elevation over aircraft performance (endurance). I believe opinion in this forum is to choose 1,000 feet. From a low wing aircraft, much more 'real estate' is blocked from the wings the higher you fly. From low altitudes, your wings block less 'real estate', but you compromise distant viewing. In open ocean, it would seem preferable to be at a lower altitude. This way the effect you get from spotting an object on the horizon would be much more apparent. If you "doubt everything," then please stop posting to the Forum. Under your standard, you must doubt that we exist, that the Forum connects you to other people, and that posting makes any difference. Unreasonable doubt causes mental death just as much as unreasonable faith. If you are willing to operate under the criterion of "reasonable doubt," then you should be able to accept some testimony as reliable (e.g., that the plane never landed on Howland, that no parts of it were found in the 1937 search, that the radio logs exist, etc.). I have never seen or operated a Western Electric Model 13C. The schematic shows where a meter could be connected to report the load on the antenna, but it doesn't reveal whether such a meter was installed on this model. If she is transmitting successfully and not receiving for the entire trip to Howland then why would she stop transmitting on her trip SE towards the Phoenix islands? If she has no way to know if she is transmitting then the lack of receiving didn't stop her from transmitting. She was transmitting without getting any reception but she kept transmitting. If she has no method of knowing she can transmit from inside the aircraft but continues to transmit then why did she stop or why did Itasca not hear? The radio is her ONLY means of telling people (Itasca) where she is. So, Marty and Ric ( and anyone else), the radio transmits but doesn't receive. It has two frequencies being monitored by Itasca. Itasca hears her. She doesn't hear Itasca but continues to transmit. They decided to fly NW then SE but sends only one message about flying the LOP. Nothing more is heard until the post loss signals when she is on the ground. Why no messages? Did she decide, near Howland, that she had a radio problem and stopped transmitting only to decide on the ground she would try again? I'm stumped. I know we don't know for sure what happened but what is "likely"? But you're surmissing Ric that at a point while travelling NW he tells her to turn around and head SE. (See section 8 of previous post). Based on what facts would he tell her to turn? 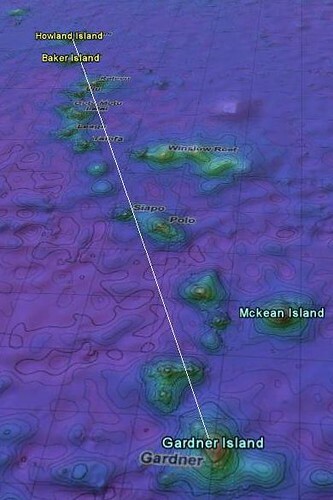 The fact that their fuel supply is limited and all of the possible alternate islands are southeast of Howland. Whichever direction they search first and how ever far they go, they will have to backtrack that far if they do not find Howland in order to continue their search. No way to avoid that. The only thing that makes sense is to go northwest as far as you dare first, then turn around and head southeast and just keep going. The question then becomes - how far do you dare search to the NW before you turn around, knowing that the farther you go, the more fuel you'll waste back tracking? You are 20 hours into your 24 hours of fuel - well into your 20% reserve. Go NW for half an hour and, if no Howland, back track half an hour. Now you're back where you started from with only 3 hours left. Go NW for 45 minutes and now you'll have burned an hour and a half of fuel getting back to square one - and you still don't know which way it is to Howland. But you do know that all of the other islands are southeast of Howland so you had better just keep going SE, hoping to find Howland but knowing that even if you're headed away from Howland you're headed toward land. I respectfully suggest that at about an hour after turning SE on the LOP that they came to the realization that they missed Howland and now it was time to find any island or ship. Thanks to Ric and Erik for their posts. Thank you Marty for your post. I should clarify that I believe in "reasonable doubt". I thought by saying I do not "necessarily" accept all answers as being "unquestionably" correct that I was saying I "do" accept some answers as being correct. And I have known some answers to be incorrect. Nowhere in any of my posts have I, knowingly, said or suggested that I "doubt everything". The detail in your answer makes a lot of sense and your second answer is spot on. Unless a diary is found that would explain all of this we will never know. Now what about the lack of radio transmissions? If she is transmitting successfully and not receiving for the entire trip to Howland then why would she stop transmitting on her trip SE towards the Phoenix islands? We don't know that she did stop transmitting. All we know is that Itasca stopped hearing her. Why would that be? What changed? Earhart told us what changed. She said she was going to try her other frequency, 6210 KHz - her "daytime" frequency. After all, it was now daylight and she had heard nothing from Itasca on her "nighttime" frequency, 3105 KHz. So why didn't Itasca hear her on 6210? Perhaps for the same reason Lae didn't hear the day before on 6210 until five hours after departure. The peculiarities of her transmitting antenna, the way radio waves interacted with the fuselage of her airplane, and the propagation properties of that frequency meant that she could only be heard if she was much farther away than she was. 3105 was almost as weird. Itasca stood the best chance of hearing her at maximum strength if she about 150 nautical miles away. Under about 40 nm there was virtually no chance they would hear her. These counter-intuitive conditions are not a matter of speculation but of detailed computer modeling of the aircraft and the antenna system. Erik, if you "flew" the route from SW of Howland on Google Earth at 1,000 feet and did a 360 degree search, as you fly, is it possible to see any other land? I don't think so but it would be nice to have more info. As pointed out in previous posts we should not rely on the accuracy of Google Earth as it is only a software program that has some issues. Perhaps the new X Flight simulator will give a more accurate representation. Ric, when you say the radio information is from detailed computer modelling of the aircraft and antenna systems. Is this new information to be released or existing on the forum? Bob Brandenburg, who has done most of the radio propagation work, has a number of papers on the TIGHAR website but this latest work has not yet been published. I'll be covering much of it in the TIGHAR Journal 2011 to be sent to TIGHAR members in October. I will enjoy reading both Bob's historical work and the new journal when released. With respect to radio communications, They (AE and Itasca) were successful in comunicating with each other on 7500 kHz. Why didn't they continue on that frequency? Why change to 3105 and then to 6210? Because it's daytime? or nighttime? I mean. really, accept success and get on with flying alternate plan B to Gardner. And by all means tell the folks on Itasca where you are going so that the Cavalry can steam full speed ahead and rescue you. Anyway, at some moment in time they (AE/FN) probably realized that they had a radio problem and the first order of business after successfully landing on Gardner would have been to fix the radio, thus the post loss transmissions at low tides.